In 1927, the British Air Ministry, faced with the need to deal with increased bomber performance, issued Specification F.20/27 for a single seat interceptor. Unlike previous fighter Specifications, the resulting aircraft were intended to be short ranged (not intended to mount standing patrols), fast climbing high altitude aircraft, carrying a minimum of equipment. To meet this requirement, de Havilland developed as a Private Venture the DH.77, designed by W.G. Carter, of Gloster Aircraft Company,[a] in close collaboration with engine designer Frank Halford. 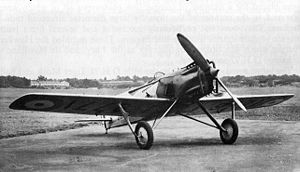 The DH.77 was a small low-winged lightweight monoplane , of mixed metal and wood construction, powered by a 300 hp 224 kW Napier Rapier air cooled H-engine, which offered very low frontal area to minimise drag. The wing was braced with distinctive bracing struts above the wing, while the aircraft had a wide track fixed tailwheel undercarriage. It was fitted with large span ailerons and an all-moving tailplane to give good control characteristics and spin recovery. Armament was the normal pair of synchronised Vickers machine guns, mounted on each side of the cockpit. The single prototype first flew on 11 July 1929. Despite the low power of the Rapier (which gave only 60% of the power of the Rolls-Royce Kestrel which powered the competing Hawker Hornet), the DH.77 demonstrated excellent performance, reaching 204 mph (328 km/h) (although performance carrying a full military load was less, reaching 185 mph (298 km/h)). It was delivered to Martlesham Heath for evaluation by the Aeroplane and Armament Experimental Establishment on 12 December 1929. Although the prototype was purchased by the Air Ministry, no production followed, the orders going to the heavier and more powerful Hawker Fury, production version of the Hornet. The DH.77 continued in use at Martlesham until 1934.
a There was an agreement between de Havilland and Gloster to co-operate on the development of de Havilland military aircraft. 4. a b c Mason 1992, p.224. 5. a b c Jackson 1987, p.290. 7. a b Jackson 1987, p.291.